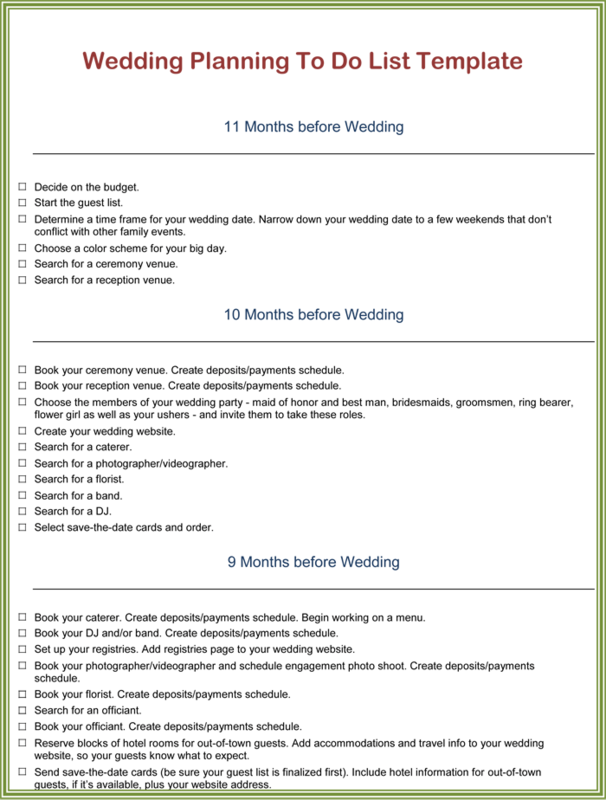 Wedding to do list template: The first thing you should do in order to plan your wedding, is pick a color scheme. Color schemes can vary, depending on the season and your own personal taste. Some women choose only the colors that they like, whereas others choose colors matching the season. There are typically two colors: whatever you want, and then typically white, black, silver or gold. However, you may choose any two colors that you want because it’s your big day! The second thing you should do when planning your wedding is choose a location. Do you want it to be outside or inside? A lovely building or go with traditional, inside a church? Thirdly, you should choose a wedding party: who your maid of honor, best man, bridesmaids and groomsmen will be. Who is going to be your flower girl and your ring-bearer? Next, you need to sit down and write down a guest list. If you’re on a tight budget, only invite your closest friends and family. Between this point until the wedding, there are lots of details you need to tend to, such as choosing a cake, getting decorations, buying invitations, buying bridesmaids dresses, renting tuxedos, buying a wedding dress, choosing flowers, a florist, photographer and video-grapher. If you decide to, you need to plan the rehearsal and rehearsal dinner. A wedding to-do list template can be the most important part of the wedding, because it keeps you in-track and helps you decide exactly what you need to get done. It can save a ton of hassle. The wedding to-do list template is very detailed. Although, it combines a lot of things to do within a month’s time span. At eleven months until the wedding, the template says to pick your color scheme, your date, start the guest list, and choose the place for the ceremony itself as well as the place for the reception. The rest of the months are just as detailed, and just as cramped. Planning a wedding can seem tedious, stressful and like a bit of a hassle, but with a thoroughly detailed template such as this one, you’ll have your wedding planned in no time and no stress at all.